Dr. Peter Polski is a licensed chiropractor who graduated from Northwestern Health Sciences University in Bloomington, MN. 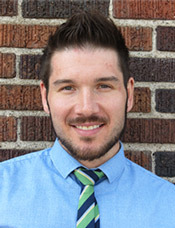 Prior to completing his Doctorate of Chiropractic, Dr. Pete received bachelor’s degrees in Human Biology and Spanish Language from Minnesota State University, Mankato. He also studied Latin-American and Spanish Peninsular literature at the Universidad de Guadalajara in Mexico. Dr. Pete became a chiropractor because it enabled him to pursue his dream of helping others lead lives that are fuller and healthier. He takes pride in fully addressing the concerns that each patient has, while promoting healthy lifestyle choices through education. His focus in treating patients is to address the root cause of dysfunction through natural means such as acupuncture, muscle training, and innovative chiropractic techniques. Dr. Pete embraces the importance of education to empower patients to take charge of their own health through nutrition and exercise. In his spare time, Dr. Pete enjoys outdoor activities like camping, hiking, and fishing. He stays active with weight training and yoga, and enjoys traveling for leisure and service causes. Dr. Pete is a foodie with a real passion for dining on a dime as healthy as possible. He loves to cook for people who appreciate his unorthodox and flavorful food. Call and schedule an appointment at our Uptown chiropractic office today!